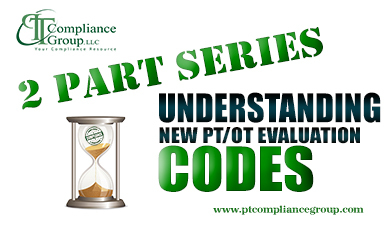 On January 1, 2017, CPT codes for physical and occupational therapy evaluation (97001, 97003) and re-evaluation (97002, 97004) will be deleted from the CPT listing on the Medicare Fee Schedule. Three new evaluation codes and one new reevaluation code for each discipline will replace them. The evaluation codes are divided into three levels: Low complexity, Moderate complexity and High complexity. Each level has specific components that must be included in the evaluation to meet their criteria. As a therapist you will need to understand the components for each level and select the appropriate code based on the presence of those components in your evaluation. And, of course, you will need to understand the potential compliance risks with code selection. Please contact us and we will gladly help out!